The Comfort Inn hotel in Greensburg, PA near Arnold Palmer Regional Airport will get you rested and ready for anything. 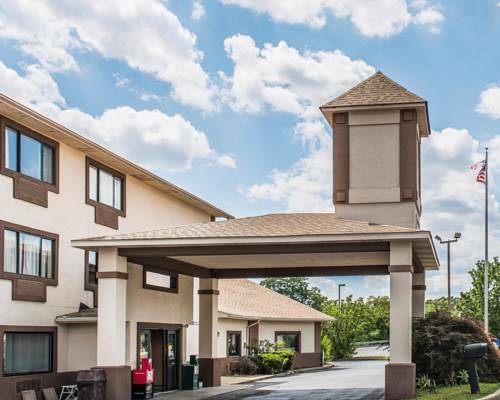 Located right off the Lincoln Highway, this smoke-free hotel is near destinations like Seton Hill, University of Pittsburgh at Greensburg, Westmoreland Mall, The Palace Theatre and Historic Hannas Town. Enjoy amenities like free hot breakfast, free WiFi, indoor heated pool, fitness center and access to copy and fax services. Guest rooms include a flat-screen TV, refrigerator, microwave, hair dryer and coffee maker. Select rooms feature a work desk and sofa sleeper. Also, earn rewards including free nights and gift cards with our Choice Privileges Rewards program. This hotel is a 100 percent smoke free facility. Pool closed for renovations until 2/5/10. Steepest incline for a railway that can carry vehicles, built between Johnstown and a flood-resistant ridge. Tourists enjoy the near-vertical ride with their cars. An art professor's museum in a former clothing boutique exhibits fine examples of human tinkering of animals and organisms though breeding and genetic manipulation. America's beloved movie star is remembered in exhibits that include a six-foot-tall stuffed version of his invisible rabbit friend, Harvey.